Online Services are now up and running, please register at reception with Photo ID. 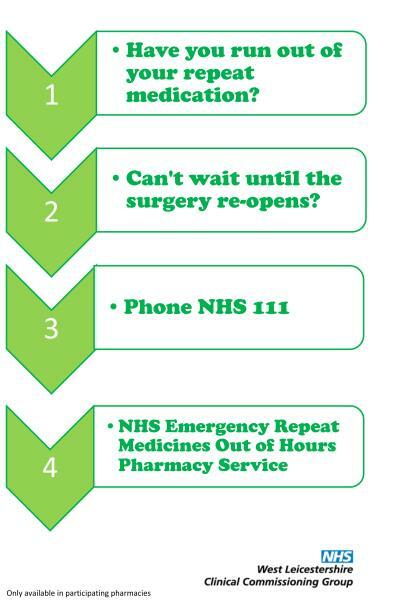 111 Service - If you need urgent medical care when the surgery is closed please dial 111. Please refer to the opening times when we are closed section. If you feel you need to see a GP today we will ensure that you are able to discuss your concerns with a clinician. Pharmacy First Scheme - Doctors’ appointments aren't always necessary. Think Pharmacy First for people with certain minor ailments and conditions. For more information please refer to our latest news page. You can request your repeat medication by indicating the items you require on the tear-off slip of your prescription and posting it to us or handing it in at the practice reception. If you enclose a stamped self addressed envelope we will post your prescription back to you. Patients on repeat medication will be asked to speak to a doctor at least once a year to review these regular medications and notification should appear on your repeat slip. Please allow two full working days for prescriptions to be processed by the practice and a further one day for the pharmacy to process. Remember to take weekends and bank holidays into account. The practice has introduced EPS2. The GP's can generate, sign and transmit a prescription to the patient’s nominated pharmacy with no need to produce a paper prescription. This electronic management of prescriptions allows patients to collect their medications from a pharmacy at a location convenient to them- it could be near your place of work. If you wish to join in this scheme please go to your preferred pharmacy and let them know you want them to be your nominated pharmacy. They will then register your details and inform us that you have joined the EPS scheme. Patients that attend the surgery for dressings, and are not exempt from prescription charges, will have to pay for their own dressing prescription which will be issued for them from the surgery. If you will have to pay for four or more prescription items in three months or more than 15 items in 12 months you may find it cheaper to buy a PPC. NEVER dispose of your unused or unwanted medicines down the toilet. These changes are happening because there is now a large range of gluten-free products available in supermarkets and online, which there weren't before. Over the past few years these products have reduced in price. We have been asked by West Leicestershire CCG to raise awareness of the costs of infant formulas prescribed for cow’s milk protein allergy as the average cost of these specialist formulae are much greater than standard formulae. For example one tin (400g) of specialist infant formula can cost approximately £30. We would like to reassure you that we will continue to prescribe these for your child but are asking you to take extra care when ordering on prescription. After talking to patients about over the counter medicines for minor conditions and understanding their experiences , the local Clinical Commissioning Group is asking GPs to no longer prescribe medicines on prescription for the short term treatment of minor ailments, low dose vitamin D supplements for prevention of deficiency and some specialised infant formulas. Patients will be asked to purchase them over the counter instead at the local pharmacy. Community Pharmacists are best placed to help and advise people about suitable treatment for minor conditions. They are a great source of information, advice and guidance and you can buy your medicines cheaply and easily for minor conditions. The pharmacist will check the medicine is appropriate for you and your health problem. They will ask questions to ensure there is no reason why you should not use the medicine. However if you are worried or your symptoms get worse or persist you can still make an appointment to see your GP. By visiting your pharmacy you will help to free up valuable GP and nurse time, which can be used to deal with more complex or serious health needs. Have your questions and queries answered, please see below. Why are we asking you to buy ‘Over the Counter’ medicines for short term treatment of minor ailments, low dose vitamin D supplements and some infant formulas? In 2017 we reviewed how people accessed over the counter medicines for the short term treatment of minor ailments. The sorts of conditions we reviewed included headaches, indigestion, head lice, travel sickness, hay fever, diarrhoea and insect bites and stings. We also reviewed Vitamin D supplements and specialised infant formula which can be prescribed for babies with reflux or lactose intolerance. We wanted to understand how people would be affected if they had to buy these types of medicines, that are easily bought over the counter, instead of requesting a prescription. We learnt that the majority of people do already buy their own medicines to treat minor ailments. We also learnt that the majority of people are willing or very willing to buy medicines for minor ailments. People also told us that the information, advice and guidance that the pharmacists gave them was really helpful and that it was unnecessary to see their GP and they would rather people only used their GP for series conditions which in the long run would improve access for everyone to their GP surgery. There were some people who were concerned particularly if they had a long term condition and wanted to understand a little more about the effect of mixing medicines. Other people wanted to know more about the quality and strength of over the counter medicines. Some people were concerned about affordability of some medicines. The CCG think that the NHS belongs to everybody and the results of our survey show that patients feel the same way. Patients also told us that they think resources need to be used in the best possible way for all patients. We are therefore asking GPs not to prescribe medicines on a prescription for the short term treatment of minor ailments, low dose vitamin D supplements for prevention of deficiency and some specialised infant formulas. Patients will be asked to purchase them over the counter (OTC) instead. We are also asking patients not to request these items on their prescription. We think asking people to self-care in this way is a fair way of utilising resources wisely as most of these items can be purchased in pharmacies and supermarkets at a low cost, but cost the NHS more to prescribe on a prescription. The infant formulas selected for self-purchase are similar in cost to standard infant formulas. The review told us that many people already feel that their community pharmacist is their first point of contact. They support them with a range of ailments and they prefer to talk to them about minor conditions savings GP appointment time for more urgent problems. Community Pharmacists are best placed to help and advice patients regarding suitable treatments for common ailments. However if they are worried or their symptoms get worse or persist they can still make an appointment to see a GP. We have taken all patient questions, queries and concerns from the review and responded to them and added other information which we think you will find useful. What are over the counter (OTC) medicines? Over the counter medicines (OTC) are those that can be purchased in a pharmacy under the supervision of a pharmacist. A limited number of medicines can also be purchased without pharmacy supervision in shops and supermarkets but are often sold in lower pack sizes or lower strengths. Can Community Pharmacists diagnose minor ailments? Pharmacists have to complete 4 years of undergraduate training and one year post graduate training and also pass a professional exam before they qualify and practice as a pharmacist. Part of this training includes completion of an accredited training program on minor ailments. If you are feeling unwell, speak to your community pharmacist as the first port of call. They will be able to recognise symptoms of a minor ailment and offer you advice or treatment accordingly. They will also recognise symptoms are of a more serious or persistent nature and if it is appropriate recommend that you seek further medical advice. However if you are still worried you should make an appointment to see your GP. You can always call NHS 111, which will help you find the right NHS service. Can community pharmacists advise me if an OTC will interact with my prescription medicines? If you are taking medicines prescribed by your GP and you are worried about taking an OTC treatment, a pharmacist will be able to advise you on drug interactions. The pharmacy that dispenses your repeat prescription will be able to check their records of all the medicines that they have supplied you so that they can advise you. Community pharmacists can also view your Summary Care Record which has details of any medicines supplied directly by the pharmacy and also the hospital pharmacy if you are also receiving treatment there. So wherever you are, the local community pharmacist will be able to check what medicines you take and advise if you are suitable to take OTC remedies. If they have any queries they will speak to your GP. You can also be prepared by asking your GP on your next routine visit whether there are any OTC preparations you should avoid. Can my community pharmacist advise which is the most suitable OTC medicine for me if I have a long term condition? Again speak to your pharmacist if you have any concerns. They will be able to advise patients on the safe use of OTC of medicines in the majority of cases. If they need further information that you cannot provide, they will be able to contact your GP surgery or advise you to see your GP if appropriate. What if I want to discuss something in private that is intimate or upsetting? The majority of community pharmacists have a private room for consultations which you can request to use if you want to discuss an intimate or personal problem. At busy times you may have to wait a little while but the counter assistant will be able to advise you if this is the case and how long you will have to wait. However, normally it shouldn’t be a problem to see the pharmacist reasonably quickly. Your pharmacist can also talk to you confidentially without anything being noted in your medical records, which some people may prefer. Most people have access to a community pharmacy within a short distance of their home. However, if you genuinely struggle to get to a pharmacy, then talk to your pharmacist to see if they can help to find a solution. It is also worth keeping a small supply of some OTC treatments at home in your medicines cabinet so that you have them at hand in the first instance if you don’t feel well. Watch our short video for advice on what to keep at home. The quality of medicinal treatments is regulated by the Medicines and Health Regulatory Authority (MHRA). This means that all licensed medicines bought over the counter must go through detailed safety and quality tests. There should be no noticeable difference in treatment of symptoms between a medicine that you can buy and those supplied on prescription. There are restrictions on the quantity of some OTC medicines that you can buy at any one time but these should be enough to manage a minor illness. Larger quantities can be sold by a pharmacy than in supermarkets. Your pharmacist can advise you on what the limits are. Will I have to purchase OTC medicines if I have a long term condition? If you require regular, long-term treatment with a medicine then this will be prescribed for you if your GP thinks you need it, even if it can be purchased OTC. However, unless you require a medicine on a regular basis you will be expected to purchase OTC preparations for minor illnesses like everyone else. Your GP may also remove some OTC medicines from your repeat prescription if you are not taking them regularly and ask you to purchase it when you need it. You can help by letting your GP practice know if you have over the counter medicines on your repeat prescription and you don’t take it regularly. Why do the prices of OTC medicines vary so much? Prices of similar preparations vary between pharmacies and it is worth shopping around if you know what you need. Some pharmacies have websites which will tell you the products that they stock and prices. It may be worth asking your pharmacy if they stock non-branded products which may be cheaper than their branded equivalents. Will this affect me if I have a pre-paid certificate? If you have a pre-paid certificate you will also be asked to purchase your OTC treatments for minor ailments. However, if you need regular treatment for a chronic condition, then this will be supplied on prescription covered by your pre-paid certificate. What about administering OTC to small children at school or nursery? The majority of treatments for minor ailments can be given before the school day starts and last long enough so that another dose does not have to be given until the child returns home. These should be purchased over the counter. Please don’t ask your GP to prescribe paracetamol or ibuprofen “just in case” for this purpose. This advice does not apply to you if your child receives paracetamol or another analgesic on prescription for long term management of chronic pain. If this is the case please refer to your school’s Medicine Policy. What if an OTC medicine has been started by the hospital? If you are admitted to hospital, you will be given an adequate supply of medicines when you are discharged which will be free of charge. This may also include medicines for minor ailments if you have been prescribed these during your stay and it is thought that a further supply will help your recovery when you go home. However, if they are not required on a regular long term basis, then they will not be added to your repeat prescription and you will be asked to purchase them in the future. What if I am in a residential home? In Leicestershire, Care Homes are expected to provide a limited range of OTC medicines to adult service users who require symptom relief for treatment of headache, back ache or muscular pains, fever, constipation, cough, indigestion and coughs for up to 48hrs. The medicines can be provided without calling out the GP. However, if there is cause for concern, the care home staff should consult with either their community pharmacist or their GP practice. Who needs to take vitamin D? It is essential for everyone to ensure that they have an adequate intake of vitamin D to keep our bones and teeth healthy. It also helps our bodies to absorb calcium. Most of our vitamin D intake comes from sunlight and a small proportion comes from our diet. Public Health England advises that pregnant and breastfeeding women, babies and children under 5 years, older people, people with darker skin and those not exposed to much sun should take a vitamin D supplement on a daily basis. Vitamin D is particularly important for pregnant women, to help keep their bones healthy and so that their babies are born with enough vitamin D in their bodies for the first few months of life. If you fit into one of these groups then you should purchase a supplement from your local pharmacy or supermarket. Women and children who qualify for the Healthy Start scheme can get free supplements containing the recommended amounts of vitamin D.
Unfortunately some people do develop symptoms of vitamin D such as rickets in children, and bone pain caused by a condition called osteomalacia in adults. If this is the case your doctor will prescribe a high dose vitamin D supplement on prescription for a short period of time to treat the deficiency. Following on from this it is recommended that you take a low dose supplement to prevent you from becoming deficient again. Your GP will advise you on what dose you should purchase. They may also recommend that you increase your daily intake of calcium if your calcium intake is inadequate. This can be achieved by increasing foods in your diet that contain calcium or by purchasing a supplement OTC. Oral vitamin D present in food and in supplements comes in the form of either colecalciferol or ergocalciferol. Colcalciferol is derived from animal sources and ergocalciferol from plant sources. Colecalciferol is usually the preparation of choice as it is the natural vitamin made by humans from sunlight. You will be advised by your GP what dose to take if you need vitamin D to treat deficiency and then ongoing supplementation. Will this affect me if I have a long term condition? You will be asked to purchase vitamin D supplements for prevention like everyone else. Some people will continue to have them prescribed however. Will this affect children who have previously been treated for vitamin D deficiency? Children who have been treated for vitamin D deficiency and some children in high risk groups who have low levels of vitamin D will continue to have low dose supplements prescribed. What about administering vitamin D to children in school or nursery? If your child requires vitamin D supplementation, it can be given once daily either in the morning or evening outside of school hours. Vitamin D preparations can be bought in quantities that should last you several months or longer depending on the product that you buy. What if vitamin D has been started by the hospital? If you have been diagnosed with a vitamin D deficiency, then treatment courses of vitamin D will be supplied. However adults will be expected to purchase low dose vitamin D for prevention unless you belong to a high risk group. There is no change to the management of care home residents with respect to vitamin D supplementation. Why do costs of vitamin D supplements vary so much? Prices of similar preparations vary significantly between pharmacies, supermarkets and health food shops and it is worth shopping around. Some pharmacies have websites which will tell you products they stock and prices. All strengths of vitamin D (also known as cholecalciferol) can be bought from your community pharmacist. You can also buy some vitamins D supplements from the supermarket. Breast feeding is the best form of nutrition for a good start in life. However some parents decide that bottle feeding with infant formula is the best option for them and their child. This may be for a variety of reasons including for example failure of an infant to put on weight. Unfortunately some infants have an allergy to some of the constituents in the infant formula. Other infants require thickened formulations to prevent acid reflux. In these situations, it is necessary to use specialised infant formulas which are different to the standard cows’ milk based infant formula given to infants without these problems. Traditionally specialised formulas are supplied on prescription until the infant is weaned on to a solid diet. Nowadays some of the thickened infant formulas and those used for lactose allergy are available from supermarkets and can be bought at a similar cost to non-specialised infant formulas. Will I have to incur additional costs of having to travel to find a suitable product as small village shops have limited stock? The infant formulas included for self-care are available to purchase in larger supermarkets and community pharmacies. Most people have a community pharmacy within a short distance of their home. You will be given advanced notice by your GP practice to give you time to find a retailer who stocks or who will supply these formulas before your prescription is stopped. Prices of similar preparations vary between pharmacies and supermarkets and it is worth shopping around if you know what you need. Some pharmacies have websites which will tell you products they stock and prices or give them a call on the telephone. What if I am struggling with my financial situation? What should I do if I think my baby is allergic or intolerant to cows' milk? If you think your baby is having a reaction to cows' milk, you should see your GP to discuss your concerns. What if Soya or Lactose Free Formula or Thickened Infant Formulas have been started by the hospital’? You will still be asked to purchase these infant formulas if they have been recommended by the dietitian at the hospital.